A fresh notification has been delivered by National Institute of Construction Management and Research for NICMAR Admission Notification. National Institute of Construction Management and Research offered this notice for all those students have an appetence to become a part of their campus by taking admission in Post Graduate Programme (PGP) can apply by submitting applications on or before the closing date. 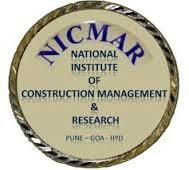 Every year National Institute of Construction Management and Research is conducts various courses. Students who have successfully passed this exam they are studies in believed Institute. Candidates who desire to do good study in National Institute of Construction Management and Research and want a respected job after study, it is appropriate manner that they can perform in several courses and make perfect study in National Institute of Construction Management and Research. Candidates, who want to participate in NICMAR Admission, must submit application form after read the all advices and points from official announcement. The official website for National Institute of Construction Management and Research is www.nicmar.ac.in, from where students can get all info of NICMAR Admission. 2 Year - PGP ACM/ PGP PEM/ PGP REUIM/ PGP IFDM ->> A Bachelor’s degree in the field of Engineering in any discipline/ Architecture/ Planning with minimum 50% aggregate marks can apply for following programmes. 1 Year - PGP MFOCB ->> Bachelor’s degree in any discipline with minimum 50% aggregate marks and belong to a family having construction business can apply for the following programme. Also required to provide necessary documents and undertaking in the prescribed format regarding ownership of construction business. PGP CSCDM/ PGP QSCM ->> A Bachelor’s degree in any discipline with minimum 50% aggregate marks can apply for the following programme. Work experience will be an added advantage. PGP HSEM ->> Bachelor's degree in Engineering in any discipline or Diploma in the field of engineering in any discipline with minimum 50% aggregate marks in all criteria and minimum four years of experience can apply for the following programme. Online Mode ->> The NICMAR Application Fee can be submitted through the Citrus Payment Gateway/ Billdesk Payment Gateway/ Net banking/ Credit Card/ Debit Card. Admission Process ->> Selection of the candidates will be done on the basis of their performance in NICMAR Common Admission Test (NCAT), Personal Interview (PI) and Rating of Application (RA). Exam Centre ->> Cndidates are required to select any one of the following exam centres. List of centres are mentioned below select from them according to your suitability. Go to “Latest Update” section & press on “ADMISSIONS: Full Time On-campus Post Graduate Programmes” link and press on “Advertisement” tab over there. Press on “Link 1 - http://admission.nicmar.ac.in” link. Login yourself and fill online application form with complete details in suitable manner. Upload all required documents and certificates with application form and make the payment of fee through proper mode. Take the print out copy of application form for future use.